Get excited for a new series of group piano lessons created by WOLO School of Arts & the Happy Keys Piano Program! ​Registration for Fall 2019-2020 coming! 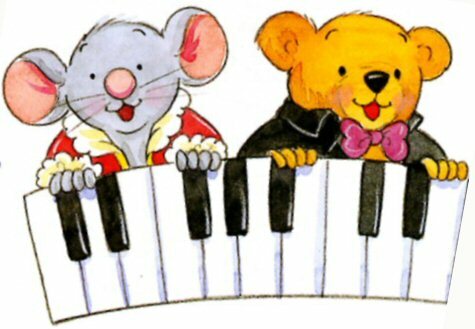 A fun musical learning journey for 45-minutes each session on the piano with Beethoven Bear, Mozart Mouse™ and our WOLO musical friends! Young children will learn the basics of piano and explore music by singing, dancing and exploring other instruments too while building on their fine motor skills/techniques, letters/numbers and imagination! Pre-requisite: Not required. A great introductory to piano before next level of group lessons or private piano lessons! Join us on a musical adventure with our Wunderkeys™ friends and WOLO musical friends! Our 30-minute group lessons help your prek-kinder stay engaged, constructive, positive, and FUN learning environment! Children will focus on math, finger techniques, singing, playing duets with teacher, develop their rhythm, sound and sight and the notes on the keyboard/letters as well as playing/exploring on the keyboard, listening and sharing their creations! Pre-requisite: Not required. Are you looking for a program that captures the child's playful spirit? 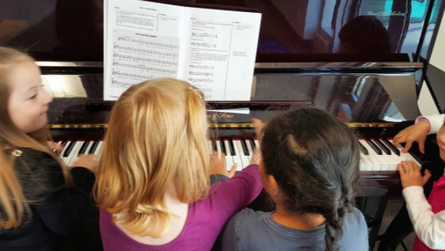 Join us in our weekly 45-minute Piano Adventure®'s group piano program filled with fun-filled songs, rhythm games and technique activities develop beginning keyboard skills. My First's three levels, A, B, and C, each have a Lesson Book with CD and a Writing Book. Book C of this young beginner course leads into Level 1 of basic Piano Adventures®. Pre-requisite: Be able to write your name, 1-5 and A-G.
Join us for 18-20 weeks of 60-minute fun and engaging piano learning through the Wunderkeys™ and Happy Keys piano curriculum. These group lessons will focus on: learning notes on the piano, notes on the staff, basic rhythm activities, basic piano technique, composition on the keyboard, and learning to play songs! Each student will have their own keyboard in class. There are 3 levels prior to private lessons. A great introduction to the piano before beginning private piano lessons. Join us for a series of 18-20 weeks of 60-minute weekly group piano lessons and 15-minute weekly private piano lessons. These group lessons will focus on: sight reading and ear training piano games, basics of theory, elementary rhythm activities, preliminary piano technique, composition on the keyboard, and learning to play songs! There are 3 levels to this program. Once students have completed all 3 levels, they can continue move on fully onto private lessons. Join us for a series of 18-20 weeks of 60-minute weekly group piano lessons and 30-minute weekly private piano lessons. Students are required to progress each week through group activities. Students will develop their ear training, sight reading, learn music history, piano techniques, and listening skills while encouraging self-expression and fostering creativity. Students will be introduced to rhythmic concepts systematically, dynamics, damper pedalling, body and hand position exercises.